As I have begun to see numerous rumors in the VMware forums that the next major release will deprecate the usage of the vSphere thick client (and the simple fact that VMs created using the most recent extensions include features that cannot be managed with the desktop client) I decided to take the plunge and install the HTML5 fling host client on my ESXi host. I also understand that Flings are experimental and should not be run on production systems. There are several ways to install it, but the recommended method is to use the esxcli command from the console of the ESXi host. Since I have SSH connectivity allowed to my ESXi host, this is the method that I chose. You can also remove is via the esxcli command from the console as well. After the installation has completed you can access the login screen by visiting the ESXi host welcome page or by appending “/ui” to the end of the FQDN (or IP) of your ESXi host. If you navigate to the ESXi host welcome page, you will see an additional link “Open the VMware Host Client” that has been added to the screen above the paragraph describing the functionality of VMware vCenter. vCenter also has a new HTML5 fling, but I as I am running the “free” version of ESXi, I don’t have access to vCenter. The initial view after logging in is of the Host Management functions. From here you have easy access to create or register VMs, shutdown or restart the host, and additional functions which are in the actions dropdown menu. 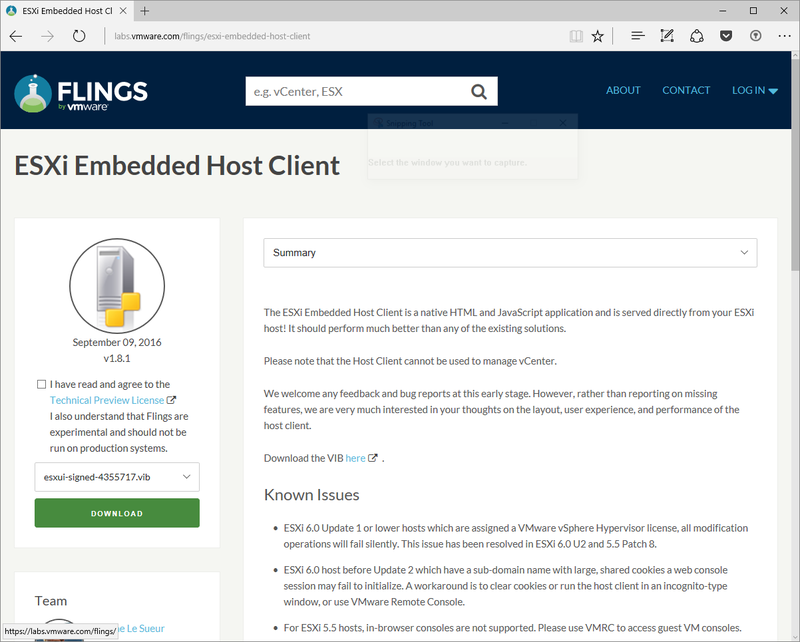 As you can see from the following screenshots, the HTML5 interface gives you access to a plethora of management and monitoring screens where you can manage or view the various settings and performance metrics of the ESXi host. When you select a VM the bottom pane changes to present a summary screen showing a preview of the current console, as well as basic hardware stats on the VM. When you select a single VM from the list you are also given access to a menu showing the various actions that you can perform on the VM. When you select a VM from the listing you are presented with a more complete picture of the settings, performance and configuration of the VM. You are also presented with any notifications regarding the state of the VM (mismatched OS, VMware Tools state, etc.). You also have the ability to view a series of monitoring graphs similar to what is available for the overall ESXi host. Selecting Storage from the left column presents a view of the storage subsystem of the ESXi host. From here you can manage the datastores (the default view), as well as the storage adapters and devices. Selecting a single item in the datastores list is similar to the way the listing of VMs works, in that you are presented with a summary of the single datastore. Clicking on the hyperlink to a single datastore opens a view that is specific to the single datastore, confining the information and actions to that datastore. The monitoring screen for a single datastore is similar to the event listing of the overall system, however it is restricted to events involving only the datastore. While I am most familiar with the “thick” client and the flash-based interface of vCenter, I have found the HTML5 fling replacement for the standalone client to be quite functional. I am still working on changing the methodology for some functions that I am used to in the standalone client. I look forward to the improvements to the web client that are on the way.